The concept is very simple. 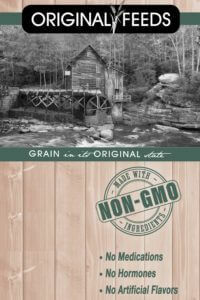 Original Feeds is a blend of grains in their original non-GMO state – the way their Creator created them. Our vision is to produce a “Back to the Basics” feed, allowing you the opportunity to feed your livestock much the same as they were fed in the mid-1900’s. This premium, all-natural feed is blended with grains that have been lab-tested and meet the highest levels of purity. The ingredients typically found in this feed non-GMO corn, soy, alfalfa, molasses, small grains and minerals. Interested in an affordable source of non-GMO feed and seed? We carry a full line of non-GMO products, bagged feed, and crop seeds, as well as natural feed additives for optimal animal health. 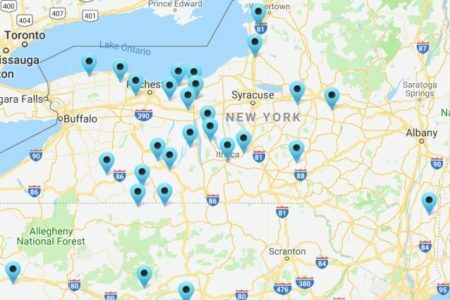 It’s our pleasure to provide New York and Pennsylvania farmers with non-GMO feeds. Pick up your orders, or ask about delivery! Whether you have poultry, dairy, hogs, goats, or horses, we’ve got you covered with a superb selection of non-GMO feeds, containing ingredients with the highest levels of purity.